Education is no different from any other business or organisation when it comes to technology - there is a lot of money and time to be saved by implementing digital strategies. That's where e-learning authoring tools come in. E-learning – which is a big part of the growing EdTech industry – describes the process of learning by making the most of modern technology. That’s not to say traditional means of education are dying, but academic institutions and businesses have identified that we can achieve a lot more by utilising our tech. The fact is, most of us have smartphones and other internet-connected devices, and there are already a whole host of apps that aim to make learning easier and quicker. If you’re revising for an exam, you can access materials wherever you happen to be. And if you want to learn a language, you can use language learning apps and online flashcards. Through digital means, learning is on tap. It doesn’t take long to find out a fact, or to develop a specific skill. With this in mind, the way training organisations and educators create courses is also dramatically changing. In this article, we’re looking at the best e-learning authoring tools available right now. When it comes to business solutions and software, Adobe always comes near the top, and this is also the case in the area of e-learning. Adobe Captivate is the company’s high quality e-learning authoring tool. The system is available for both Windows and Mac computers, and it offers an ever-expanding variety of features. Making use of HTML functionality and responsive design, the software lets you create courses that run on PCs, smartphones and tablets. There’s support for scalable HTML, play bar and mobile themes, and you also have the ability to pause and resume work whenever you want. What’s more, you can import storyboards from Captivate Draft (which is free on iOS devices), and also use the software with PowerPoint-based projects. All text, audio and other functionalities are retained. Elucidat is a web-based system that’s been designed to make creating learning resources easy. It boasts a built-in page template editor, which lets you choose a theme and tweak it to your requirements. If you’re looking to publish courses in multiple languages and versions, you’ll be happy to learn that you can manage hundreds of courses at the same time. And because there’s built-in responsive output, your creations will look good on all screen sizes. It’s worth noting that before committing to a premium plan, you can try the software for free - but only for 14 days. 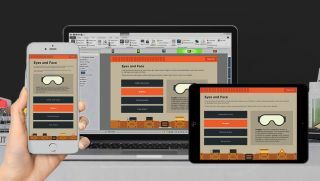 While most e-learning authoring tools have responsive capabilities in terms of catering for different screen sizes, Articulate 360 has been created especially for people who want to put mobile first. The platform lets you create highly interactive and visual courses for every device, without having to tweak anything. You simply click publish, and Articulate - through its Storyline and Rise features - automatically ensures your course is mobile-ready. As well as this, all courses support touchscreen gestures, and the built-in player hides sidebar menus and the like so that all the focus is on the multimedia content. That’s not all, though. When it comes to creating a course, it’s not necessary to have any prior technical experience. Instead, you can access a library of themes, which have been tailored for different use cases. There’s also a text and image editor, meaning you can get everything right before you make a course public. And when you make changes, all your work is saved on the cloud – just in case something goes wrong. You can even get educational experts to check over your work through a review system, which supports different languages such as Chinese, German, French and Spanish. As you may have realised by now, many e-learning authoring tools are web-based, and that’s also the case for Shift eLearning. It’s designed to help you create powerful e-learning resources efficiently and quickly. Like its competitors, you don’t need any programming experience to be able to create a feature-packed e-learning resource. There are more than 400 responsive screen templates to choose from, utilising both HTML5 and Adobe Flash. These are off-the-shelf themes, so you don’t actually have to do a lot, apart from entering text and graphics. When you’ve finished putting a course together, you don’t have to worry about tailoring it for different users. The system has a one-push feature, so hitting the publish button once will send it to a variety of devices – regardless of their screen size, resolution or aspect ratio. There’s a generous free trial you can check out, too. Lectora Inspire is one of the oldest e-learning authoring tools, now in its seventeenth version. It’s another web-based system that functions across devices, but it requires a bit more scripting experience than some of the other software listed in this feature. With it, you can create courses for different contexts, such as employee training or selling courses to customers. There’s unlimited scripting, access to advanced graphics libraries, an online reviewer and a screen template library. Another handy element provided is a range of how-to resources.